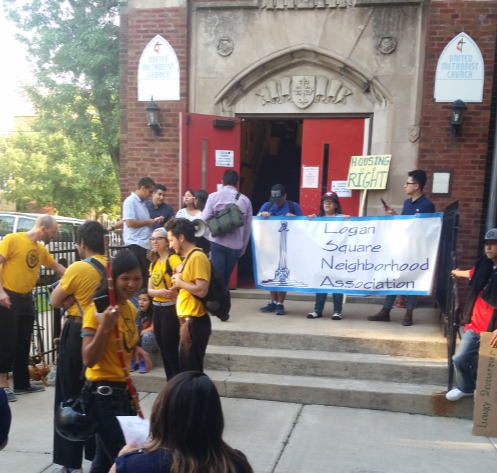 Last week, Active Trans joined a passionate rally held by the Logan Square Neighborhood Association (LSNA) to show our support for the 606 affordable housing ordinance. The event began with residents giving testimonies at Humboldt Park United Methodist Church (pictured) and concluded with a powerful demonstration on the 606 trail. As we promote trail projects, it has become clear that more affordable housing units are needed to ensure residents with low or fixed incomes are not displaced by increased property values. A central part of Active Trans' mission is the creation of healthy, sustainable and equitable communities. As a result, we are committed to supporting the work of affordable housing partners like LNSA and Latin Community Housing Association (LUCHA). Trails bring many benefits, such as improved public health, a cleaner environment and increased economic development activity. At the same time, it must be acknowledged that trails like the 606 have contributed to skyrocketing property values. A well-documented study by the Institute for Housing Studies at DePaul University found that property values along the western portion of the 606 increased by 48.2 percent since the trail broke ground. The ordinance, known as the Pilot Act for the Preservation of Affordable Housing, was introduced to Chicago City Council in May by Aldermen Moreno (1st), Maldonado (26th) and Ramirez-Rosa (35th). The act would charge developers high fees for the demolition and conversion of multi-unit housing buildings into single family homes. The ordinance is confined to an area along the 606 — the boundaries are Western Avenue, Kostner Avenue, Palmer Street and Hirsch Street. Fees range from $300,000 to $650,000 depending on how many units would be lost in the conversion. The ordinance also charges a fee for expanding an existing building. Developers can avoid fees by designating 50 percent of the units as affordable. The money raised from fines would go into an affordable housing fund overseen by a board made up of alderman, community groups like LUCHA and LSNA and officials from the city's buildings department as well as its planning and development department. Financial assistance would be provided to residents who need help maintaining their housing. The bottom line is Active Trans would like all Chicagoans to have safe and easy access to trails and low-stress bike routes. We'd love to see more people using active modes of transportation to get around the city. But the growth of trail networks must be carefully planned so they do not displace longtime residents. The 606 ordinance is a step in the right direction.